This is a very basic beginner's kit for 8 pin PICAXE microcontrollers. Includes a handful of easy-to-solder through-hole components. Be sure to purchase the 8-pin PICAXE below. 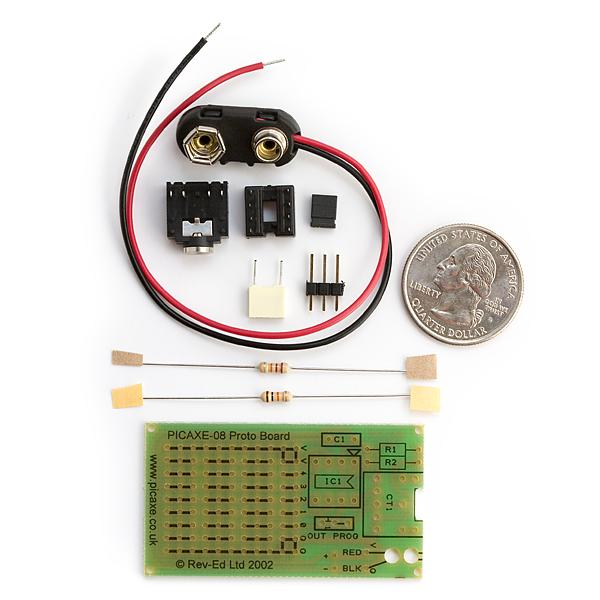 A battery snap is provided in this kit, but the board must only be driven with a 4.5 to 5V battery pack. To prevent a 9V from accidentally being attached to the 5V board, we recommend attaching the 3xAA battery pack below, in place of the battery snap included in this kit. So affordable you could throw a few across the football field! And it's only a dollar more than the plain picaxe 08M2!! Excellent small-scale project board. I used it in combination with a reed relay hooked up to a camera to control a video in my weather balloon satellite. can I use this to program a PICAXE 08M?? Yes you can. Connect to your computer with one of the Picaxe cables - either the one that goes to a serial port or the one that goes to a USB port. You can also add headers to this board so it will run LEDs, servos, infra-red detectors, etc. I would love to see something like this in some other flavors than only Picaxe. Proto kits would help a lot for such things as sensor node arrays or just plain old learning. There is really no reason for keeping something like this from being more diverse to peoples preferences. I use this to program the larger ICs that have the same power, ground and serial pin locations; I just let the other pins hang off the back of the socket. Which specific ICs are you referring to? I'd like to try that trick myself? 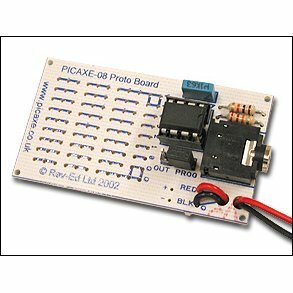 If you check out picaxe.com: PICAXE Pinouts, you'll find there's 7 models in total, of which 4 are theoretically compatible (same +V, 0V, serial in and serial out pin configuration) (PICAXE-08M2, PICAXE-14M2, PICAXE-20M2 and PICAXE-20X2) and 3 (PICAXE-18M2, PICAXE-28X2 and PICAXE-40X2) are not. Can I use this to program a PIC? No PICAXE is different from a PIC. Why put in the disclaimer about the battery, rather than just include a 5V regulator? http://www.sparkfun.com/products/107 is cheap enough, and would be easy enough to add. The kit is pre-packaged, sorry. You can just add the regulator to your cart if you want. We just wanted to keep the kit simple as there are other options for powering it with 5v (wall wart).